The CD1d-binding glycolipid α-galactosylceramide (α-GC) is a potent adjuvant that activates NKT cells and in turn enhances T-dependent humoral immunity. Very little is known about how NKT cells and the NKT follicular helper (NKTfh) subset influence the immune response to T-independent polysaccharides. In this study, we used a Cre-Lox approach to generate mice devoid of the Bcl6 master transcription factor in CD4 lineage cells and thus devoid of NKTfh cells but not total NKT cells. It was observed that α-GC–driven IgG1 class switch against a polysaccharide Ag was dependent on the NKTfh subset. However, α-GC was unable to stimulate a polysaccharide-specific Ab recall response. It was observed that NKT-derived IL-21 was able to exert limited influence on the IgG1 response and was therefore likely to work in concert with other factors. This work shows that α-GC–driven NKTfh cells can direct polysaccharide-specific B cell responses by promoting IgG1 class switch but do not provide signals needed for generation of polysaccharide-specific B cell memory. CD1d-restricted invariant NKT cells are well established to interface with B cell function and the ensuing humoral immune response to T-dependent and T-independent Ags (reviewed in Ref. 1–3). T-dependent humoral responses directed at protein Ags are typically enhanced by activated NKT cells, particularly those responding to the CD1d-presenting glycolipid α-galactosylceramide (α-GC). The α-GC ligand displays several properties consistent with function as a vaccine adjuvant, whereby primary B cell responses (4), B cell memory (5), and plasma cell longevity are positively impacted (6). Consequently, α-GC–activated NKT cells have been shown to enhance protection in animal models against several pathogens and their products (reviewed in Ref. 1). Ab responses can also be directed to lipids and glycolipids, including hapten-linked variants of α-GC (7). In those studies, primary responses were shown to be CD1d and NKT dependent but were not associated with B cell memory or longevity of response. There is limited information on the intersection of NKT cells with the humoral immune response to polysaccharides. NKT cell activation was associated with long-term humoral immunity to Streptococcus pneumoniae polysaccharides (8). A previous study by our laboratory showed that α-GC inclusion when vaccinating against a model T-independent Ag led to a selective IgG1 isotype switch without effects on the characteristic IgM and IgG3 response (4). Since that study, a subset of NKT cells has been identified and described as NKT follicular helper (NKTfh) cells (9, 10). NKTfh cells display a CD44hi, PD-1hi, CXCR5+, IL-21+ phenotype like their classical T follicular helper (Tfh) counterparts (9–11). Immunization with α-GC leads to rapid expansion of NKTfh cells, which are a product of proliferation by a parent NKT population and subsequent differentiation into NKTfh cells (12). The study described in this article was therefore undertaken to determine whether NKTfh cells are contributory to the NKT-induced IgG1 class switch previously observed against polysaccharide Ags. To achieve this, lineage-specific ablation of the master transcription regulator gene Bcl6 was used to prevent NKTfh differentiation. The results showed that NKTfh cells drove IgG1 class switch against the polysaccharide Ag but failed to drive memory responses. This work has implications for understanding how the inclusion of α-GC–like adjuvants in vaccines may affect humoral responses to polysaccharides. This study was carried out in strict accordance with the recommendations in the Guide for the Care and Use of Laboratory Animals of the National Institutes of Health. All animal procedures were approved by the University of Oklahoma Health Sciences Center Institutional Animal Care and Use Committee (Protocol 16-037). Female C57BL/6 (B6) mice were purchased from Charles River Laboratories (Bethesda, MD). Bcl6+/+;Cd4-Cre+ mice, Bcl6fl/fl;Cd4-Cre0 mice, and IL-21R−/− mice were purchased from The Jackson Laboratory (Bar Harbor, ME). Bcl6+/+;Cd4-Cre+ mice and Bcl6fl/fl;Cd4-Cre0 mice were bred for two generations to obtain Bcl6fl/fl;Cd4-Cre+ mice that lacked Bcl-6 expression in CD4+ cells and are referred to in the article as “ablated mice.” Littermates (Bcl6+/+;Cd4-Cre)+ that lacked floxed Bcl-6 but expressed Cre recombinase and those that expressed the floxed allele but lacked Cre expression (Bcl6fl/fl;Cd4-Cre0) were used as controls. Genotyping was carried out according to the protocol provided by The Jackson Laboratory for mouse stock numbers 023727 (Bcl6fl/fl) and 022071 (Cd4-Cre+). Validation of genotype and phenotype was as reported by us previously (13). α-GC was purchased from Avanti Polar Lipids (Alabaster, AL). NP-conjugated Ficoll was purchased from LGC Biosearch Technologies (Petaluma, CA). HRP-conjugated anti-mouse IgM, IgG1, IgG2b, IgG2c, and IgG3 were purchased from SouthernBiotech (Birmingham, AL). Allophycocyanin-conjugated PBS57-loaded (α-GC analogue) and unloaded CD1d tetramers were provided by the National Institute of Allergy and Infectious Diseases Tetramer Facility (Emory University, Atlanta, GA). Biotin-conjugated anti-CXCR5 (2G8) and FITC-conjugated anti-TCRβ (H57-597) mAbs and PE–Texas Red–conjugated streptavidin were from BD Biosciences (San Jose, CA). The PE-Cy7–conjugated anti–PD-1 (J43) mAb was from eBioscience (San Diego, CA). FcR-blocking mAb 2.4G2 was from Bio X Cell (Lebanon, NH). Mice were immunized s.c. in both flanks with a total of 5 μg NP-Ficoll plus 4 μg α-GC, in a 200 μl total volume of sterile low-endotoxin PBS. The amount of α-GC administered has been determined previously to exert a CD1d- and NKT-dependent effect on anti–NP-Ficoll IgG1 responses (4). Pilot experiments were used to confirm the α-GC adjuvant effect for this study (data not shown). The booster vaccine consisted of 5 μg NP-Ficoll in PBS administered s.c. over both flanks. The booster was administered on day 60. Bleeds were performed on days 14, 60, 67, and 74. Assays were performed as described by us previously (14), with NP-BSA being used to coat the plates. End point Ag-specific Ab titers were defined as the greatest dilution factor at which an absorbance >2 SD above the background absorbance in the assay could be detected. Axillary and inguinal lymph node cells were isolated by mechanical disruption, and erythrocytes were removed by hypotonic lysis. Cells were then incubated in RPMI 1640 media containing 1% v/v FBS, FcR-blocking mAb 2.4G2 (20 μg/ml), PBS57-loaded CD1d tetramer (3.5 μg/ml), and fluorochrome-conjugated mAbs diluted to the appropriate concentrations. After incubation for 1 h at room temperature under light-protected conditions, cells were washed three times with PBS by centrifugation (200 rcf, 5 min, room temperature). After binding, cells were chilled to 4°C and incubated with PE–Texas Red–conjugated streptavidin for 30 min (BD Biosciences). Cells were then washed and fixed in 1% w/v paraformaldehyde in PBS and analyzed by flow cytometry using a Stratedigm S1200Ex flow cytometer (Stratedigm, San Jose, CA). Data were analyzed using FlowJo software (Tree Star, Ashland, OR). Fluorescence minus one controls and empty CD1d tetramer were used to determine gating as described previously (12). Data were analyzed using GraphPad Prism 6.0 (La Jolla, CA). A two-tailed Mann–Whitney U test and an ANOVA with Dunn posttest were used to compare two and multiple experimental groups, respectively. To determine if NKTfh cells contribute to the α-GC–stimulated anti-Ficoll Ab response, mice lacking expression of the Bcl6 master transcription factor were generated (Fig. 1A). Bcl6 expression is needed for differentiation of the Tfh and the NKTfh cellular subsets (13, 15). This was achieved as described previously by two rounds of breeding to generate mice that either expressed the Cre recombinase under control of the Cd4 promoter or coexpressed Cre with two LoxP-flanked (“floxed”) alleles in the Bcl6 gene. This approach results in specific loss of Bcl6 expression in CD4 lineage cells including Tfh and NKTfh cells (13, 15). NKTfh cell ablation reduces IgG1 class switch against NP-Ficoll. (A) Littermate control mice (Bcl6+/+;Cd4-Cre+ and Bcl6fl/fl;Cd4-Cre0) and Bcl6-ablated mice (Bcl6fl/fl;Cd4-Cre+) mice were generated by two rounds of breeding as shown. Standard genotyping was employed using protocols provided by the vendor. (B) Control and Bcl6-ablated mice were immunized s.c. with 5 μg NP-Ficoll plus 4 μg α-GC before collection of sera on day 14. IgM, IgG1, IgG2b, IgG2c, and IgG3 anti-NP titers were determined by ELISA as described previously (4). The Bcl6+/+;Cd4-Cre+ and Bcl6fl/fl;Cd4-Cre0 controls are represented by black and blue symbols, respectively. The Bcl6fl/fl;Cd4-Cre+ ablated mice are represented by red symbols. Results are representative of two independent experiments. Each symbol represents an individual mouse. A Mann–Whitney U test was used to determine statistical significance. Littermate control mice (Bcl6+/;Cd4-Cre+ and Bcl6fl/fl;Cd4-Cre0) and Bcl6-ablated mice (Bcl6+/+; Cd4-Cre+) were selected from the different genotypes produced. The mice were then immunized with NP-Ficoll plus α-GC before collection of sera and analysis of anti-NP Ab titers by ELISA (Fig. 1B). NP-specific IgM, IgG1, IgG2b, and IgG3 were produced in the control mice. NP-specific IgG2c was not detected. We previously established that the NP-specific IgG1 was attributable to inclusion of α-GC in the immunization and was CD1d and NKT dependent (4). In the Bcl6-ablated mice, the IgM and IgG3 titers were unchanged, but the IgG1 titers were reduced significantly and by 87%. 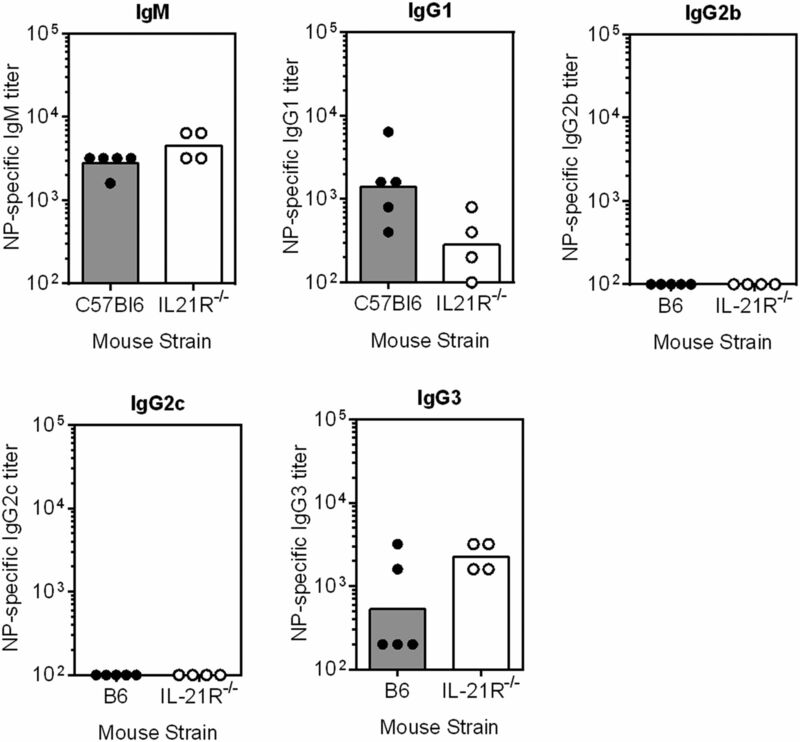 The low IgG2b titer in 50% of the control mice was not observed in the ablated mice. Immunization with α-GC alone did not stimulate an anti–NP-Ficoll response, consistent with earlier results (4). The absence of Tfh cells in the ablated mice does not confound the results herein because NP-Ficoll Ab is well established to be a T cell–independent Ag. This result demonstrates directly that NKTfh cells are largely responsible for the IgG1 class switch induced by the α-GC ligand. NKTfh cells characteristically secrete IL-21 and IL-4 (8–10, 12, 13), which is consistent with the Th2-driven IgG1 class switch observed. The immunized mice were then tracked until day 60 after immunization (Fig. 2). The NP-specific IgG1 titer was stable, diminishing nonsignificantly over the 60-d time period. On day 60 a “booster” vaccine consisting of NP-Ficoll was given, and sera were collected on days 67 and 74 (Fig. 2). 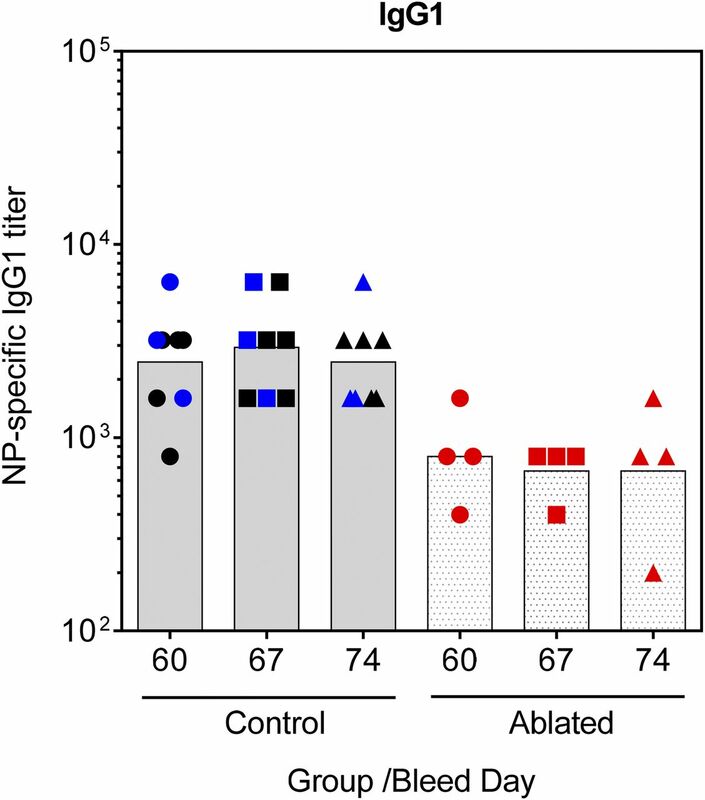 The NP-Ficoll booster did not lead to any significant changes in the Ab titers in the control or the Bcl6-ablated mice. The difference in titers between the control and ablated mice was still evident by days 60, 67, and 74, although statistical significance was only detected on day 67. This result shows that α-GC could not induce an IgG1 recall response to NP-Ficoll after a 60-d resting period. Similarly, in B6 mice administered Ficoll or Ficoll plus α-GC, booster effects could not be detected 21 or 60 d after initial immunization (data not shown). The results show that the NP-Ficoll/α-GC vaccine modality did not stimulate B cell memory but stimulated a fairly stable population of IgG1-secreting cells. Absence of Ab recall responses in α-GC-stimulated and NKTfh cell-ablated mice. Control mice (Bcl6+/+;Cd4-Cre+ in black and Bcl6fl/fl;Cd4-Cre0 in blue) and Bcl6-ablated mice (Bcl6fl/f;Cd4-Cre+ in red) from Fig. 1 were tracked for the time periods indicated. Bleeds were collected on day 60 and followed by a booster vaccination consisting of 5 μg NP-Ficoll in PBS. On day 67 and 74, additional bleeds were collected. Data show end point anti-NP IgG1 titers, with each data point representing an individual mouse. A one-way ANOVA with Dunn posttest was used to confirm that statistically significant differences in titer could not be detected between day 60 and 67 or 74 for each group. Titers were significantly different between the control and ablated groups at day 67 (p < 0.05). Results are representative of two similar experiments. To confirm that the vaccination modality employed actually led to expansion of NKTfh cells, B6 mice were immunized with α-GC, NP-Ficoll, or α-GC plus NP-Ficoll (Fig. 3). As expected, there were minimal effects on the frequency and numbers of total lymph node NKT cells, but α-GC caused a considerable proportion of them to differentiate into CXCR5+/PD-1+ NKTfh cells. This has been described extensively in previous work, where expression of the follicular helper–driving master transcription factor Bcl6 was highest in the PD-1hi/CXCR5+ population of NKT cells (9–13). Specific to this study, NP-Ficoll did not cause any NKT or NKTfh expansion or display statistically significant additive or synergistic effects with α-GC. NKTfh cell expansion is attributable to α-GC but not polysaccharide Ag. B6 mice were immunized s.c. with 4 μg α-GC, 5 μg NP-Ficoll, or α-GC plus NP-Ficoll. After 7 d, inguinal and axillary lymph nodes were harvested and pooled. (A) Cells were stained for CD1d tetramer (PBS57-loaded) versus TCRβ to identify total NKT cells (upper row). After applying a gate on TCRβ+/CD1d-tetramer+ events, CXCR5+/PD-1+ NKTfh cells were identified (lower row). Representative dot or density plots from three mice per group are shown. (B) Gates for the NKTfh population were set using fluorescence minus one controls. NKT identity was confirmed using empty CD1d tetramer. These controls have been described by us previously (13). (C) Graph shows frequency and absolute numbers of TCRβ+/CD1d-tetramer+ NKT cells and (D) PD-1hi/CXCR5+ NKTfh cells for each experimental group. Statistical differences were detected using a one-way ANOVA with Dunn posttest (*p < 0.05, **p < 0.01, ***p < 0.001, ****p < 0.0001). Data depicted are representative of two independent experiments. To determine if NKTfh cell–driven, polysaccharide-specific IgG1 production was IL-21 dependent, B6 controls and IL-21R−/− mice were immunized with NP-Ficoll plus α-GC before collecting sera and measuring NP-specific IgM, IgG1, IgG2b, IgG2c, and IgG3 (Fig. 4). Consistent with the known ability of α-GC–expanded NKTfh cells to secrete IL-21 (9–11, 16), there was a partial reduction in IgG1 titers which was not statistically significant. Production of IgM and IgG3 production were also not significantly affected, although the ratio of IgG3 to IgG1 was increased in the absence of IL-21R. IgG2b and IgG2c were not detected. This suggests that NKTfh-derived IL-21 is likely not the only factor required in vivo for IgG1 class switch against polysaccharide Ags but may exert some influence on the response. NKTfh cell–driven class switch against polysaccharide Ag is IL-21-influenced. B6 and IL-21R−/− mice were immunized s.c. with 4 μg α-GC plus 5 μg NP-Ficoll. After 21 d, sera were collected and NP-specific IgM, IgG1, IgG2b, IgG2c, and IgG3 titers determined as described in Fig. 1. Each symbol represents an individual mouse. Results are representative of two independent experiments. A two-tailed Mann–Whitney U test did not detect significant difference between the groups. Several laboratories have independently confirmed that α-GC–activated NKT cells enhance T-dependent B cell memory responses (reviewed in Ref. 1–3). 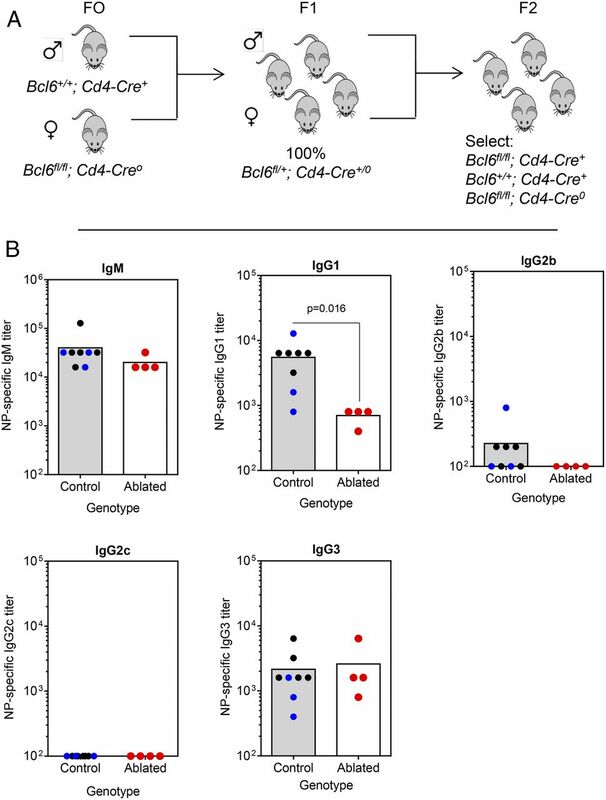 The evidence that the NKTfh subset regulates T-dependent B cell memory is less clear with the B cell help provided stimulating short-lived nongerminal center responses (9). NKT- and NKTfh-enhanced lipid specific Ab responses are dominated by short-lived IgM responses (7, 10). The Bendelac laboratory showed that NKT cells could enhance long-lived and memory pneumococcal polysaccharide-specific Ab responses (8). In that study, the Ags were packaged in liposomal structures. In this study, we did not observe recall responses, leaving the possibility that a highly efficient codelivery of Ag and adjuvant by incorporation of both into the same particle is required to stimulate NKT-dependent B cell memory. We considered membrane lipid-coated inert silica microparticles (100 nm diameter) for these studies. Beads were coated 88/10/2 with phophorylcholine/phosphatidylserine/α-GC, but stimulated a highly Th1-skewed response, which is inconsistent with the Th2-driven IgG1 responses stimulated in this study (S. Amadou Amani and M.L. Lang, unpublished observations). The Bendelac study also showed the polysaccharide-specific B cell memory effect in the presence of weak NKTfh induction, thus suggesting as we have observed that NKTfh cells may not affect B cell memory to polysaccharides. In this study, we observed a selective effect of NKTfh cells on IgG1 class switch to polysaccharide Ag. This suggests that NKTfh cells could be harnessed during vaccination when the Ab response needs to be tailored to include a Th2 IgG response or, conversely, inhibited when a Th1 IgG response is desired. Clearly more work is warranted to understand how NKTfh cells intersect with polysaccharide-specific humoral immune mechanisms and the implications for the immune response to vaccination or infection. We thank the National Institute of Allergy and Infectious Diseases Tetramer Core (Emory University, Atlanta, GA) for providing CD1d tetramers. We thank Spencer A. Hill for technical assistance. We thank the Flow Cytometry and Imaging Core Facility at the University of Oklahoma Health Sciences Center for assistance. This work was supported by National Institutes of Health Grants AI125708 and AI134719 (to M.L.L.). This article is distributed under the terms of the CC BY-NC-ND 4.0 Unported license. 2018. The influence of invariant natural killer T cells on humoral immunity to T-dependent and -independent antigens. Front. Immunol. 9: 305.
. 2018. Activation and regulation of B cell responses by invariant natural killer T cells. Front. Immunol. 9: 1360.
. 2014. Invariant NKT cells provide innate and adaptive help for B cells. Curr. Opin. Immunol. 28: 12–17.
. 2006. The CD1d-binding glycolipid alpha-galactosylceramide enhances humoral immunity to T-dependent and T-independent antigen in a CD1d-dependent manner. Immunology 119: 116–125.
. 2007. Invariant NKT cells sustain specific B cell responses and memory. Proc. Natl. Acad. Sci. USA 104: 3984–3989.
. 2013. BAFF- and APRIL-dependent maintenance of antibody titers after immunization with T-dependent antigen and CD1d-binding ligand. J. Immunol. 191: 1154–1163.
. 2008. NK T cells provide lipid antigen-specific cognate help for B cells. Proc. Natl. Acad. Sci. USA 105: 8339–8344.
. 2013. Natural killer T (NKT)-B-cell interactions promote prolonged antibody responses and long-term memory to pneumococcal capsular polysaccharides. Proc. Natl. Acad. Sci. USA 110: 16097–16102.
. 2011. Identification of Bcl-6-dependent follicular helper NKT cells that provide cognate help for B cell responses. Nat. Immunol. 13: 35–43.
. 2011. Invariant natural killer T cells direct B cell responses to cognate lipid antigen in an IL-21-dependent manner. Nat. Immunol. 13: 44–50.
. 2012. 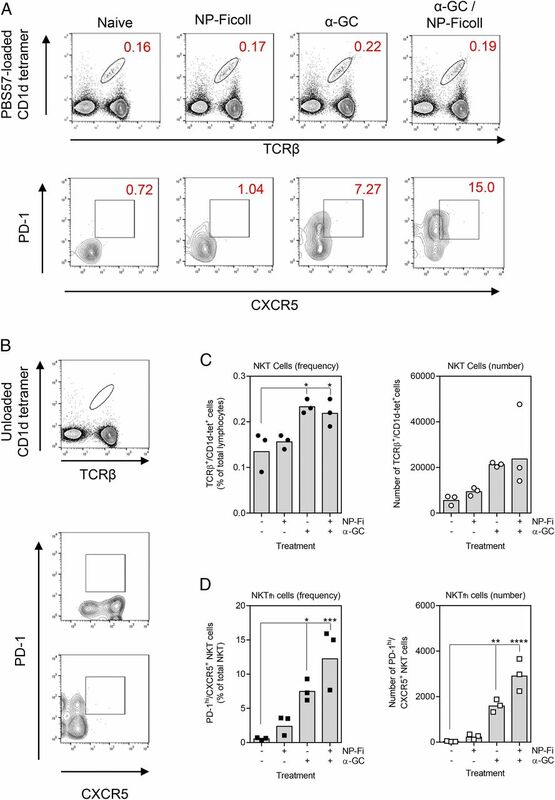 Follicular helper NKT cells induce limited B cell responses and germinal center formation in the absence of CD4(+) T cell help. J. Immunol. 188: 3217–3222.
. 2015. CD1d-dependent expansion of NKT follicular helper cells in vivo and in vitro is a product of cellular proliferation and differentiation. Int. Immunol. 27: 253–263.
. 2017. Coordination between T helper cells, iNKT cells, and their follicular helper subsets in the humoral immune response against Clostridium difficile toxin B. J. Leukoc. Biol. 101: 567–576.
. 2008. Glycolipid-activated NKT cells support the induction of persistent plasma cell responses and antibody titers. Eur. J. Immunol. 38: 1001–1011.
. 2013. Insights into the role of Bcl6 in follicular Th cells using a new conditional mutant mouse model. J. Immunol. 191: 3705–3711.
. 2007. IL-21 is produced by NKT cells and modulates NKT cell activation and cytokine production. J. Immunol. 178: 2827–2834.